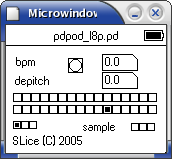 pdPod allows the creation of interactive musical applications for the iPod. It integrates Pure Data (http://www-crca.ucsd.edu/~msp/software.html) a visual sound programming language by Miller Puckette (http://www-crca.ucsd.edu/~msp/) which allows the rapid develoment of musical applications. Guenter Geiger (http://gige.xdv.org/) has made PDa (http://gige.xdv.org/pda/), a port of Pure Data for PDA linux devices which we recently adapted to run under iPod linux as well. Martin Kaltenbrunner (http://modin.yuri.at/) created a GUI application which allows the execution, display and control of PD patches from within podzilla. This application was created at the Music Technology Group (http://www.iua.upf.es/mtg/) at the Universitat Pompeu Fabra in Barcelona, Spain. Have a look at this paper (http://modin.yuri.at/publications/ipod_icmc2005.pdf) we presented at the ICMC05 (http://www.icmc2005.org) for some ideas what might be possible to do with this application for the iPod. You might also want to have a look at this little demo video (http://modin.yuri.at/publications/pdpod.avi). for the creation of custom GUIs you have to name the widgets you want to display with a preceeding "ipod_"
pdPod is based on the legacy podzilla0 code and supports all iPod models that are supported by the original podzilla. This means that all but 5G iPods can run the pdPod interface. The pd binary itself should run on all platforms though. We are currently working on a module for the new podzilla version, whish is still to unstable for a release though. This page was last modified 14:07, 30 Aug 2017. This page has been accessed 23455 times.